Morgana's Chamber opened in June 1996 on MacDougal Street in the West Village section of Manhattan. Originally, the theme of the store was "A Cauldron of Transformation!" referring to both inner and outer transformation. We carried vintage clothing, wigs, and cosmetics to transform your outer appearance; and metaphysical books and supplies to transform your innermost self. After approximately two months, the demand for metaphysical supplies was overwhelming, and quickly began taking over. At this time we also began offering classes by various teachers, and events with noted authors such as Phyllis Curott, Janet Farrar and Gavin Bone, and Silver RavenWolf. On 31st October 1997, we re-opened at our present location, 242 West 10th Street, after searching for a larger space that would suit our growing clientele. At this time, we became a full-service Pagan/ Wiccan shop. Witch Workshops are our ongoing series of classes designed specifically for Solitary Eclectic use. Morgana designed the program shortly after opening when she saw there was a need in the community for those working Solitary, and newcomers to the Wiccan path. Each workshop is set up in such a way that it is self-contained, leaving the choice of classes to attend to the individual. Because the classes can stand on their own, no continuity is lost, and one can fill in their magickal education without having to attend a complete series of classes. There is nothing to join (such as a coven or group). No degrees, initiations or elevations will be conferred at any time. Morgana teaches most classes, with special guest teachers appearing on occasion. To learn more about our classes, please click here. Our exclusive author events attract people from all over the area, and are a great way to learn something from an author who's work you have enjoyed reading. We work very hard to bring you a variety of authors who are willing to share their knowledge and expertise with the community. Click here to see what author events we are brewing up just for you! And click here to see pictures from past author events at Morgana's Chamber. Stop by and see us sometime! Be sure to pet the kitties-- Finn [hair-eating papa cat], Aradia [polydactyl mamma cat], and Morrigan [daughter cat]. Morgana began her magickal studies in the late '70's. As a fanatical researcher, she sought more information in the library after purchasing a deck of Tarot cards. Eventually she found her way into Weiser's Books in NYC, where she purchased her first genuine books on Paganism and Wicca. That path led to her finding Herman Slater's shop, the infamous Magickal Childe, where she was able to meet fellow Witches and network, as well as find the information she was seeking. Her path has been blessed with many wonderful Craft teachers and Elders, both in NYC and the surrounding area, as well as the UK, who have given their knowledge and guidance freely and humbly. For this, she is forever in their debt, and hopes she has made them proud. She is mommy to an incredible little girl, born in 1999. Along with her husband, she is the owner of Morgana's Chamber. Her husband and daughter are the most magickal part of her life. Morgana has worked both solitary and as a High Priestess of a coven. She has taught hundreds of people through the Witch Workshop classes offered at Morgana's Chamber, as well as various locations outside of the area. Morgana is a certified Usui Reiki Master Teacher, and has a talent for creating magickal incense and oil recipes, as well as extensive experience working with herbs and candles. She honors and works closely with the Fae. Her writing contributions have been published in: Silver's Spells for Love, Silver's Spells for Protection, Silver's Spells for Prosperity, and Halloween by Silver RavenWolf. 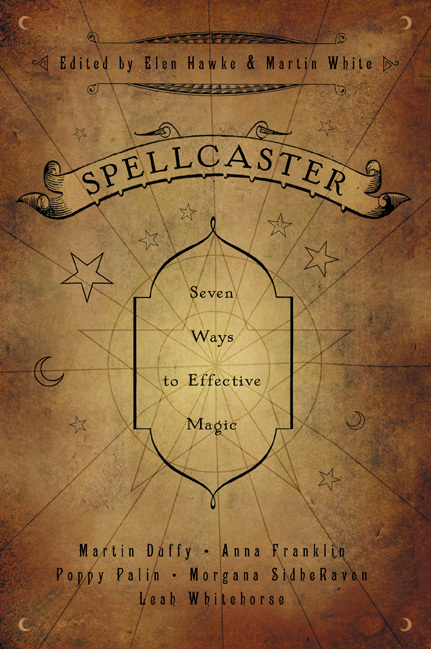 She is one of seven authors (and the only American author) who co-authored Spellcaster, Seven Ways to Effective Magic, a new book from Llewellyn Publications. (Click on the book cover below to see more about the book and read about our book release party!) Morgana is currently working on several writing projects at once, keep tuned to our website for details!